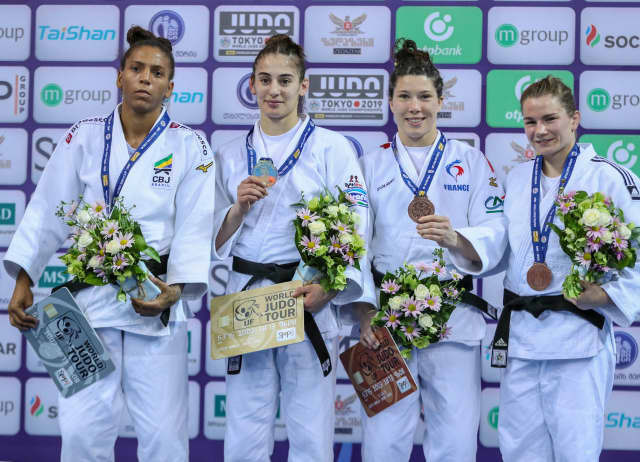 Marrakech Grand Prix bronze medallist Melanie CLEMENT (FRA) produced the performance of her life to defeat Daria BILODID (UKR), judo’s youngest world champion of all time, in the -48kg final. CLEMENT scored twice without reply to upset the 18-year-old prodigy on her return. 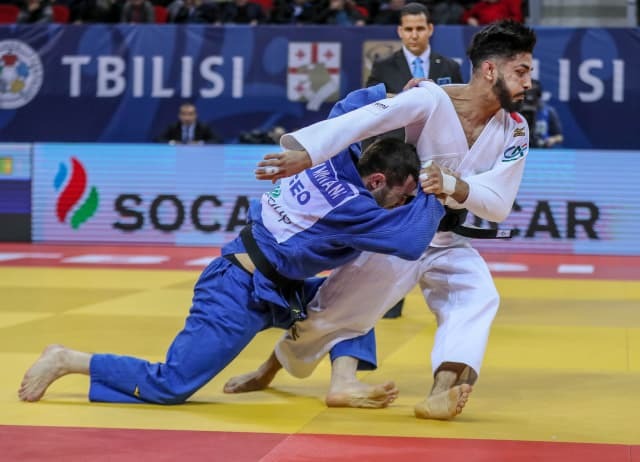 The reigning senior and junior world champion, who was competing for the first time since October, was thrown for a waza-ari with a o-osoto-gari and was then rolled over in the closing seconds for a second and match-winning waza-ari. The 38-fight winning-streak of the teenager was ended by France’s world number 15 who in turn recorded her first Grand Prix victory and jumped into the arms of her coach and London 2012 Olympic champion Lucie DÉCOSSE. In the first semi-final world number one MUNKHBAT Urantsetseg (MGL) disappointed against CLEMENT as the Mongolian was disqualified after picking up three penalties. In the second semi-final BILODID beat London 2012 Olympic bronze medallist Eva CSERNOVICZKI (HUN) who was disqualified after going out of the area. The Ukrainian led with a waza-ari from an o-uchi-gari but was then thrown with a sode-tsurkimoi-goshi for a waza-ari before the Hungarian slipped off the pace and received her third shido. The first bronze medal contest was won by Düsseldorf Grand Slam bronze medallist Nathalia BRIGIDA (BRA) who tapped out CSERNOVICZKI with a strangle in the opening contest of the final block. The second bronze medal was won by MUNKHBAT who held down world number 62 Blandine PONT (FRA) and the Frenchwoman elected to tap out with no way out of the osaekomi-waza from the ne-waza expert. Olympic silver medallist Odette GIUFFRIDA (ITA) defeated Ekaterinburg Grand Slam winner Gili COHEN (ISR) to win -52kg gold. 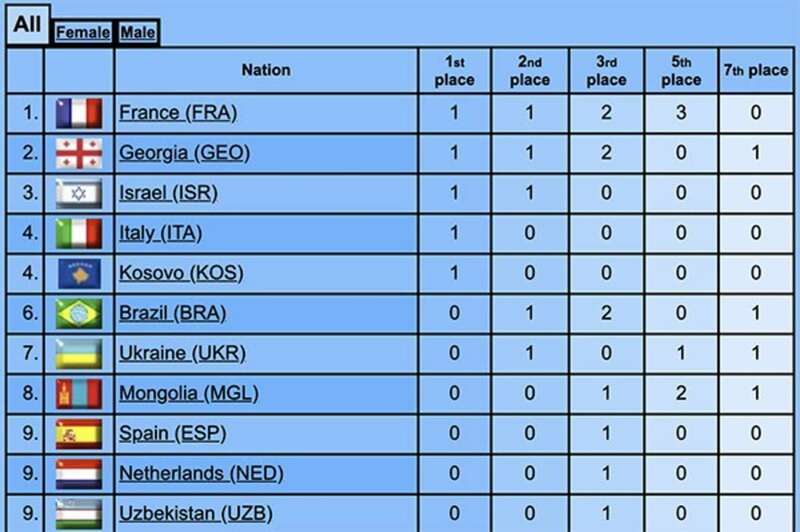 Both judoka had struck Grand Prix gold on one occasion previously and for both their victories were in Tbilisi. 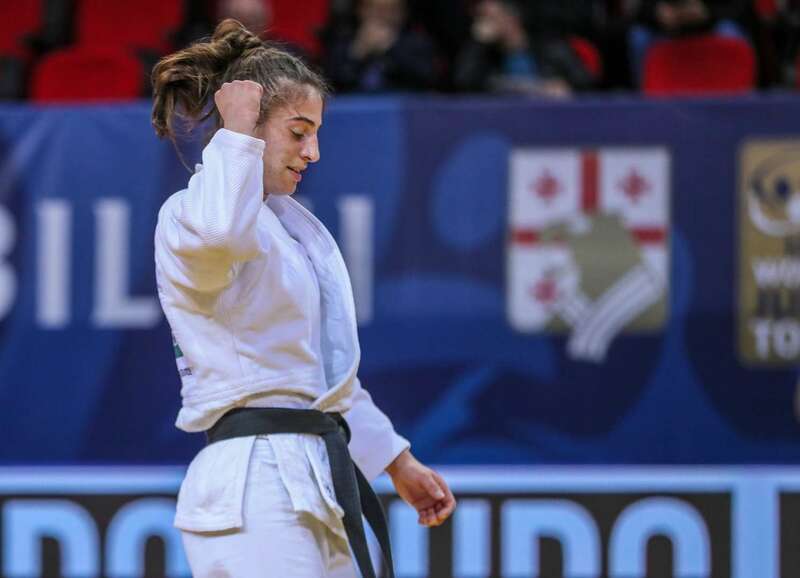 GIUFFRIDA added to her 2016 Tbilisi win by catching 2014 winner COHEN with ashi-waza as a de-ashi-barai earned a second and match-winning waza-ari. In the first semi-final COHEN bested Paris Grand Slam bronze medallist Astride GNETO (FRA) after four and a half minutes of golden score. After a marathon match-up GNETO was dismissed with her third shido for going out of the area. In the second semi-final former Ulaanbaatar Grand Prix bronze medallist Khorloodoi BISHRELT (MGL) fell to GIUFFRIDA after six minutes of golden score. The Mongolian was reprimanded for being passive to send the Italian into the final. 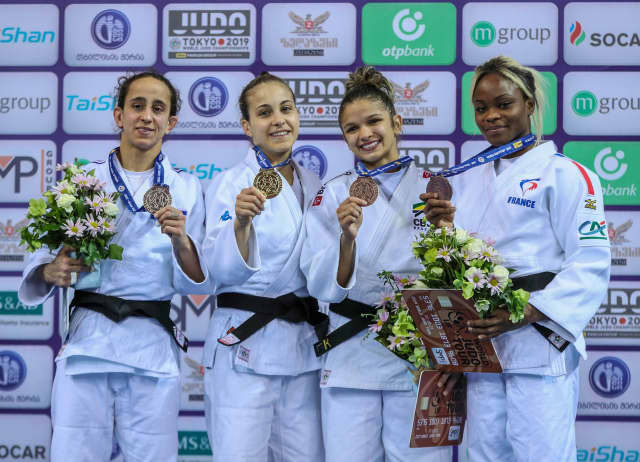 The first bronze medal was awarded to world number 50 Larissa PIMENTA (BRA) who earned her first IJF World Judo Tour medal by defeating BISHRELT. Mongolia’s youngster was penalised for a false attack in golden score and was disqualified as it was her third indiscretion. The second bronze medal was won by GNETO who floored Junior European Championships gold medallist Faiza MOKDAR (FRA) with an o-soto-gari for ippon on the edge of the area. 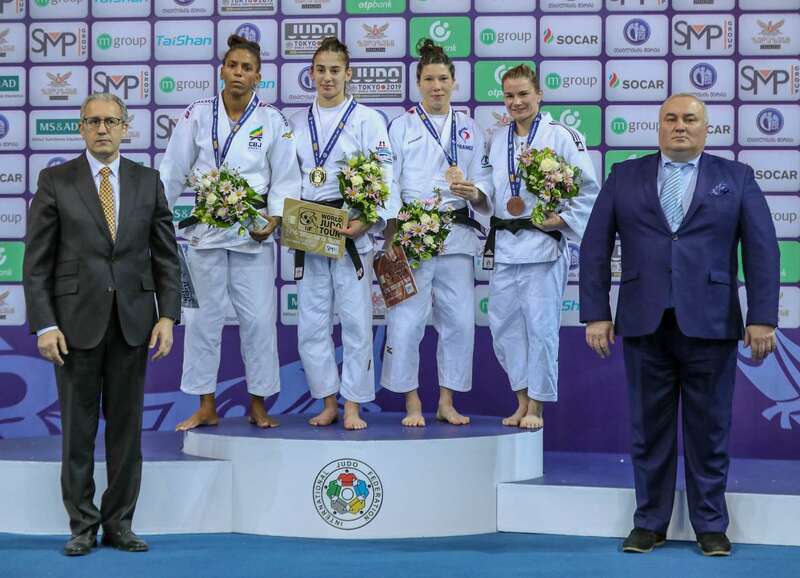 World Judo Masters silver medallist Nora GJAKOVA (KOS) celebrated for fifth Grand Prix gold medal with a win against Olympic champion Rafaela SILVA (BRA) in the -57kg final. SILVA was guilty of a bear hug in golden score and received her third shido and was disqualified. The result meant a first medal for Kosovo while Brazil earned their third after a strong start in Tbilisi. In the first semi-final GJAKOVA saw off 2014 world bronze medallist Sanne VERHAGEN (NED) by a waza-ari score. 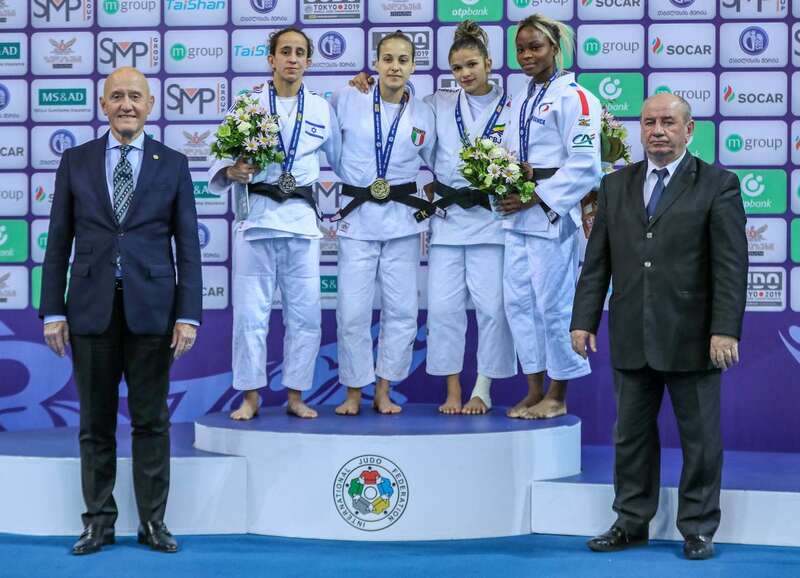 In the second semi-final SILVA conquered 2018 Tbilisi Grand Prix silver medallist Helene RECEVEAUX (FRA) by ippon. The first bronze medal was won by RECEVEAUX who proved to be too physical and powerful for Marrakech Grand Prix silver medallist Anna BOROWSKA (POL) who was disqualified after three penalties. 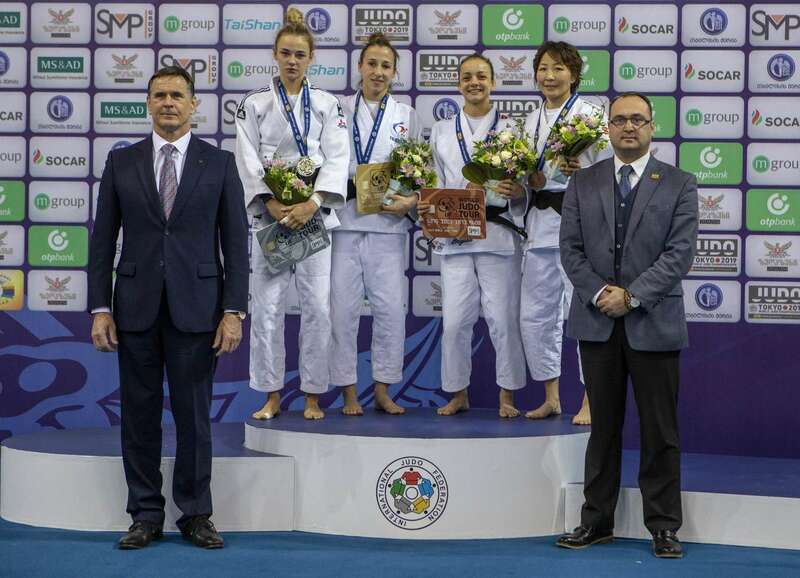 The second bronze medal was won by VERHAGEN who threw Düssledorf Grand Slam bronze medallist Sarah Leonie CYSIQUE (FRA) with an ippon seoi-nage for the maximum score. 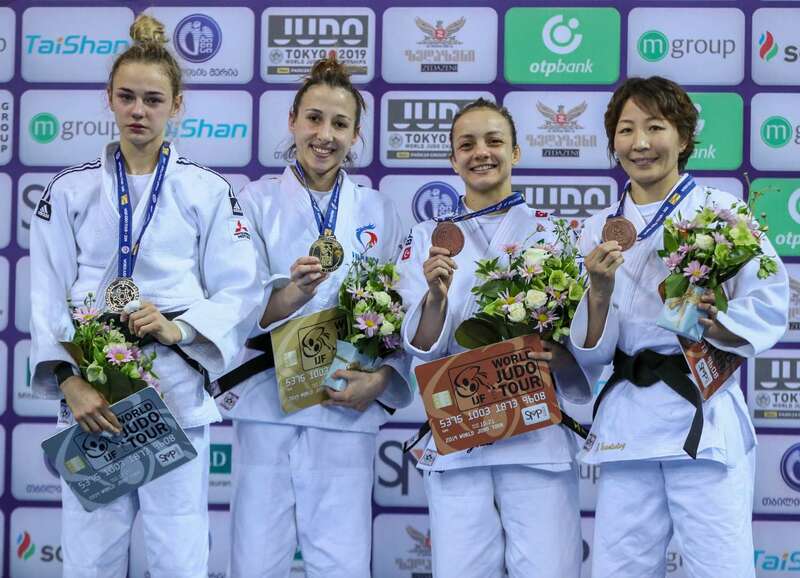 After winning her first IJF medal since 2015 the Dutchwoman will now be tipped to make a qualification run for Tokyo 2020. 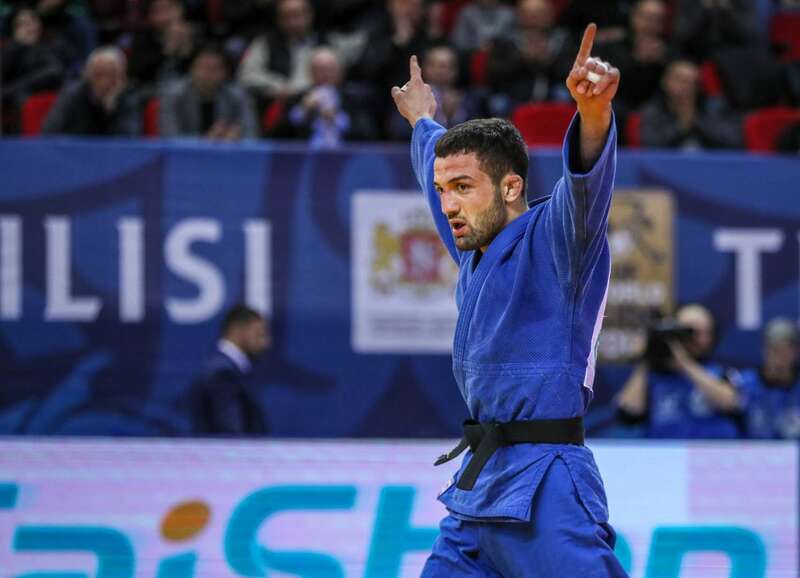 Düsseldorf Grand Slam bronze medallist Lukhumi CHKHVIMIANI (GEO) won his home Grand Prix for the third year in a row as he beat European champion Walide KHYAR (FRA) in the -60kg final. Tokyo 2020 contender CHKHVIMIANI showed his superiority on home soil as he beat one-time Grand Prix winner KHYAR by rolling the Frenchman over for a waza-ari score which was the only score in the men’s lightest final. In the first semi-final KHYAR emphatically beat Marrakech Grand Prix silver medallist Artem LESIUK (UKR) by ippon from a huge pick up. 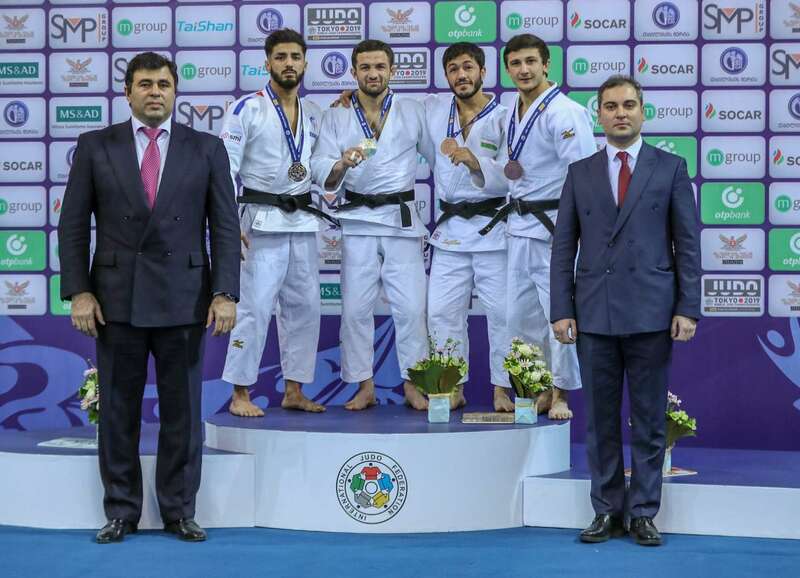 In the second semi-final CHKHVIMIANI sent over 2014 world champion GANBAT Boldbaatar (MGL) for ippon with a thunderous tai-otoshi which earned the biggest ovation of the day from the capacity crowd. 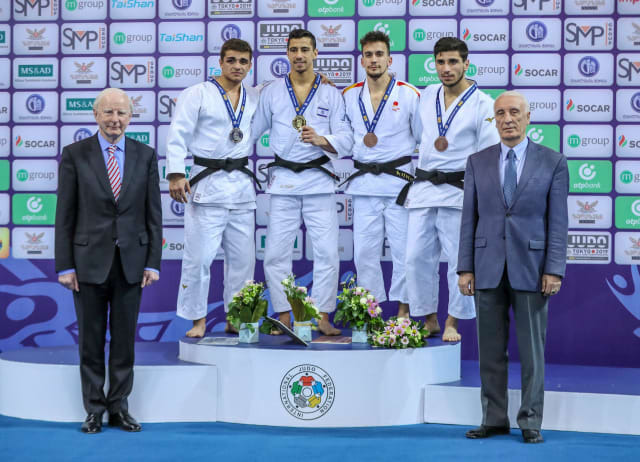 The first bronze medal was won by Marrakech Grand Prix winner Sharafuddin LUTFILLAEV (UZB) who dismissed GANBAT after two minutes of golden score with an uchi-mata to win his 13th Grand Prix medal. The second bronze medal went to Junior World Championships bronze medallist Jaba PAPINASHVILI (GEO), the younger brother of two-time world medallist Amiran PAPINASHVILI, who threw LESIUK with an o-uchi-gari for ippon. 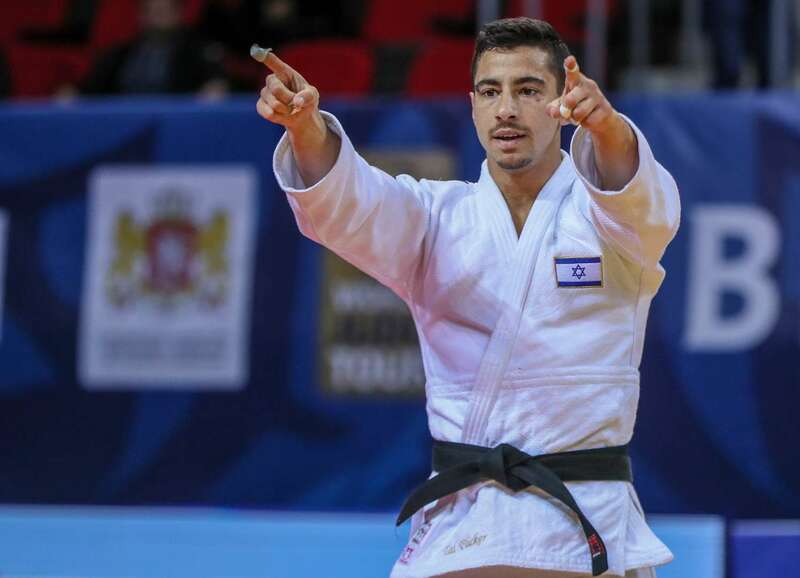 Former world bronze medallist Tal FLICKER (ISR) was made to grind out a win in the -66kg final as he met a determined IJF World Judo Tour debutant Giorgi TUTASHVILI (GEO) in the gold medal contest. 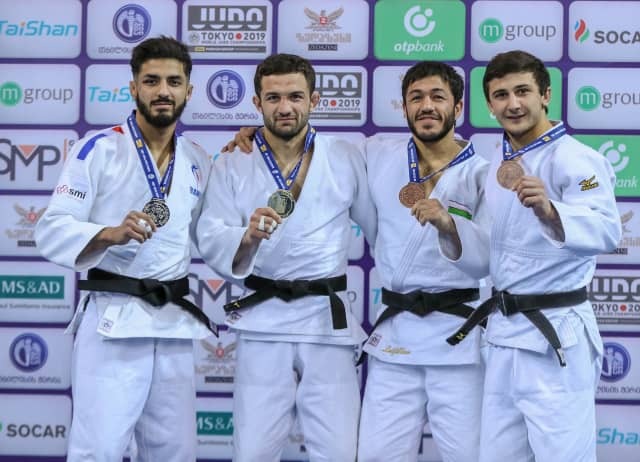 During the break FLICKER said he’d never seen or head of his fellow finalist and that was because the 20-year-old was appearing on the IJF circuit for the first time in Tbilisi. A waza-ari for FLICKER was the difference after four minutes after an exciting final against the unranked Georgian who can expect to be called upon again in the very near future. In the first semi-final FLICKER defeated world number 226 Ismayil IBRAHIMOV (AZE) in golden score when the Azeri was giving his marching orders after three shidos. In the second semi-final world number 143 Jasleen Singh SAINI (IND) lost a thriller against TUTASHVILI (GEO) which was the best contest in the preliminary rounds. SAINI went behind to a waza-ari score and was penalised twice for failing to tidy up his judogi of his own accord. The Indian revelation picked up the young Georgian to score a dramatic waza-ari and force the semi-final into golden score. TUTASHVILI added a second and match-winning waza-ari score after two minutes of additional time. 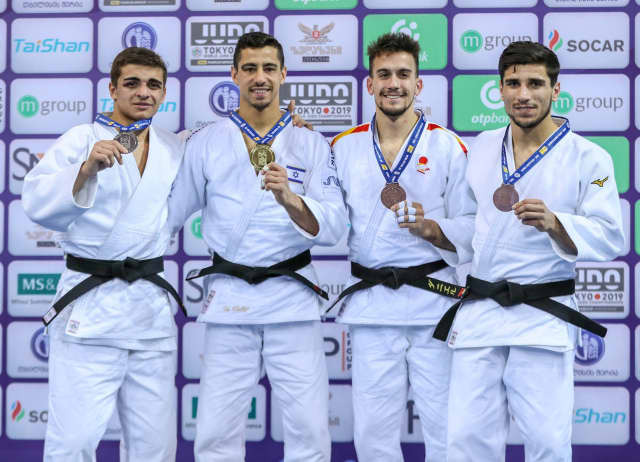 The first bronze medal was won by Rome European Open bronze medallist Daniel PEREZ ROMAN (ESP) who claimed his first IJF World Judo Tour medal at the expense of SAINI who was bidding to accomplish the same feat. PEREZ ROMAN pinned down the Indian judoka for a second waza-ari to win Spain’s first medal of the competition. The second bronze medal went to Ekaterinburg Grand Slam bronze medallist Bagrati NINIASHVILI (GEO) who clinched back-to-back IJF World Judo Tour medals by sending IBRAHIMOV over for ippon with an o-soto-makikomi.